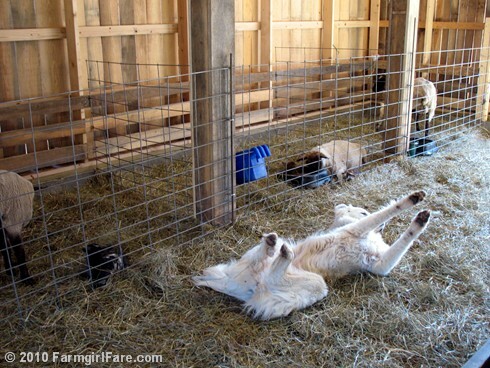 Farmgirl Fare: Saturday Dose of Cute: What's Your Diagnosis? Exhausted after a night of livestock guard duty. . .
Or suffering from a severe case of cute lamb overload? We've definitely got a cute crop of lambs this year! © FarmgirlFare.com, the hoping it's not contagious foodie farm blog where Why yes! that is the interior of our gorgeous—and tall!—new sheep barn, which you still haven't seen despite the fact that it went up (how can this be possible?) nearly eight months ago. Compared to the old ones (click here and scroll down to the second photo), these new bonding suites (where mamas bond with their newborn babies for a few days) are the bee's knees—and don't require wearing a hardhat when entering them (oh, the numerous head whacks I got from that short old barn, which was originally built for hogs, before I started wearing my hardhat). The outside of the new sheep barn is really beautiful, too. Maybe someday you'll actually get to see it. 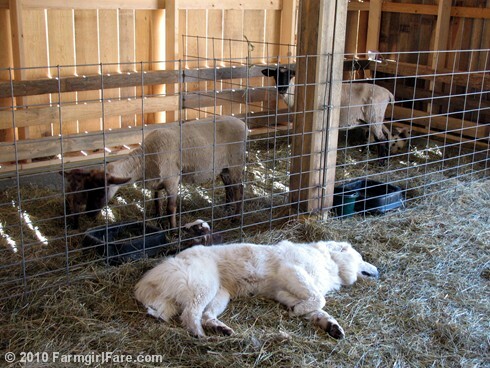 Update: you can see more of the new sheep barn here! Ahem. You were obviously reading my mind; I can tell from your response about the new sheep barn in the copyright paragraph. For me this would be Sunday Dose Of Cute, yes, very cute! Wow another farmer!!! So nice to meet you! you are amazing! you have quite the operation! i love your blog! Daisy is right - a girl has to enjoy her sleep time. Perhaps an overdose of cute lambs but methinks it is the joy of nice new bonding suite area. I was feeling pangs of jealousy looking at those photos of your new barn. 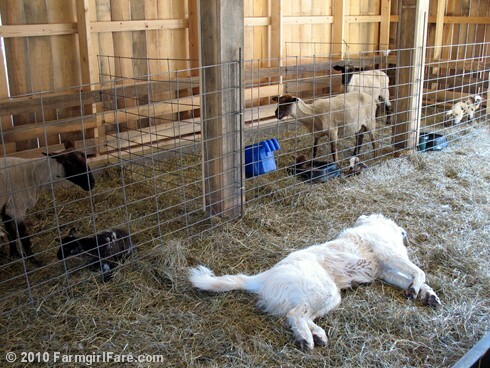 Then I realized that if WE had a new, big barn, my husband would undoubtedly want to drastically expand the sheep flock. And I'm not sure I'm ready for that. So I'll just admire yours and stick with our old, tetanus-riddled sheds. Hello! I just arrived via MY blog! From one Missouri gal to another.. (although, I'm definitely NOT a farm gal) greetings! I absolutely adore your "Dose of Cute" photos! I love all (furry) animals...as opposed to slimy ones! My dog, Tiger, looks very similar to your black and brown dog....Sorry, I didn't read enough to see his/her name anywhere. Thanks for stopping by my blog and leaving a comment. I will definitely be back!! P.S. I forgot to mention your love of Judi Ryan Hendricks novels about bread..and you also have her blog on your list!! Yay...a kindred spirit! I had a contest on my blog not too long ago, where the winner received an autographed, first edition copy of Bread Alone!!!!! Daisy is just holding the hay in place. It's a tough job, some dogs gotta do it. Also, a night of barking is hard work. 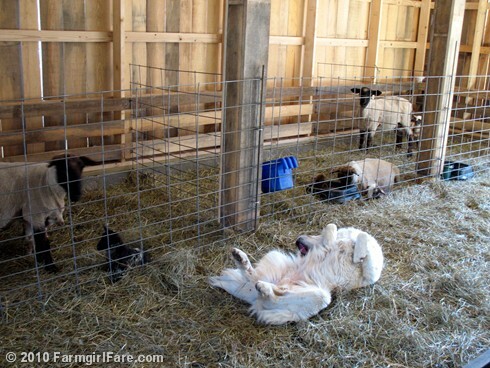 Nothing like a good roll in the hay!